Struggling with accessibility issues at your home or business? Braveheart Construction and Remodel offers the perfect solution for those who have a disabled family member or someone recovering from an injury. 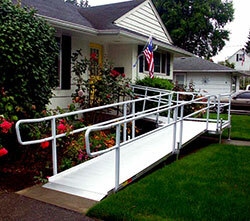 Whether you need a permanent wheelchair ramp or a temporary one, we can help. Locally owned and serving the entire Puget Sound area, from Tacoma to Seattle to Everett to Snohomish, we offer 2 types of ramps depending on your needs. For those needing a permanent solution, our wooden ramps can be added to almost any existing home or building while aluminum ramps deliver flexibility for those recovering from an accident or injury and only need it temporarily. Braveheart is a preferred contractor for DSHS-DDD and has been making modifications to home and businesses since 2006. Our specialty is working with those who are disabled to make their homes wheelchair and ADA accessible with the goal of making their lives easier and less stressful. 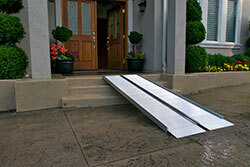 If you are unsure as to what type of ramp you need, give us a call to discuss your situation. We know exactly the right questions to ask and will give you our best recommendation. Before starting work, detailed measurements will be taken and a plan will be put in place so there will be as little inconvenience to you as possible. Once construction has started, our crew will work to complete the project in as short a time as possible while taking care of all the little details so there are no surprises when it’s done. No matter the location, we can design the perfect ramp so contact us to schedule your free estimate. We are able to take on projects at short notice so call us to discuss your time limitations and we’ll do what we can to help you. Braveheart is happy to announce we now offer aluminum ramps from EZ-Access. These aluminum ramps are perfect for so many situations as they are not permanent fixtures, they can be installed quickly and are affordable for anyone. So if you have someone who is recovering from an accident, illness or a sports injury and only need a ramp for a limited time, this is the answer. Braveheart has 3 types of aluminum ramps available for purchase or rent. 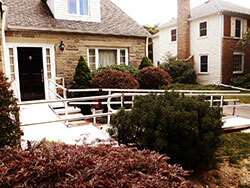 Our custom built wood handicap ramps can be added to any home or building to make your accessibility problems go away. 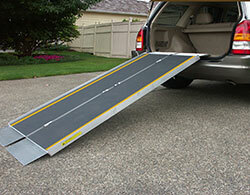 Our staff is experienced at building ramps and will work with you to design a ramp that solves your mobility issues. Ramp rental may be the best and least expensive solution when you need a ramp for a short period of time so contact us to see which type will work best for you and whether renting or purchasing makes the most sense. The commercial and modular types of ramps can be configured to work with any situation and installation is quick so if you need the ramp in a short time period, it’s absolutely no problem. Braveheart offers portable wheelchair ramps that are a durable yet inexpensive alternative when a permanent ramp is not needed or not available. They are designed to be moved with built-in handles for easy carrying and can be quickly installed when needed. 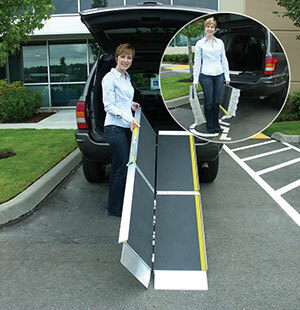 There are 3 lines of portable ramps that can be used for getting wheelchairs and scooters in and out of vehicles or when ramps are not available at a private home or business. Each line has several models, depending on your specific need, so give us a call to discuss which model will work best for you.